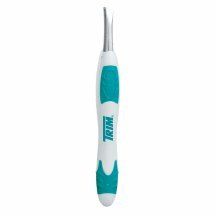 Trim Easyhold Slant Tip Tweezers. Trim® Easyhold® Slant Tip Tweezers. Non-slip grip provides maximum comfort and control. Precision-ground tips are permanently aligned for better grip to grasp and remove hair.